“To stand for the exploited and the oppressed is never a crime. To silent dissent through a systematic and widespread attacks, harassments and killings is, on the other hand, a crime against humanity. President Duterte and his fascist military and police are the real terrorists as they continuously unleash a reign of terror and commit numerous human rights violations in different parts of the country under counterinsurgency program and anti-drug campaign,” said Anakbayan-Canada co-chairperson Renz Grospe. Youth group Anakbayan-Canada denounces the red-tagging of activists and rights defenders in Negros, central Philippines. Negros Occidental Police Provincial Office Director PSSupt. Rodolfo Castil Jr.’s admitting the order the vilification campaign against leaders of legal organizations only highlights the fascist and tyrannical rule by US-Duterte regime’s minions in the military, police and paramilitaries in McCarthyite witch-hunt. “It is enraging to hear the news about the red-tagging of progressive activists in Negros Island, especially now that the government officially declared communist rebels as terrorists. This red-baiting without any ample evidences in the part of the police is an outright violation of the activists’ civil rights and expose their life to danger,” said Zharmaine Ante, Anakbayan-Canada. On Monday April 16, 2018 posters were reportedly being pinned up by the police force of the Negros town of Moises Padilla. Printed on them were 60 accused communist rebels, including a councilor of the northern Negros Occidental city of Escalante, a lawyer who has longed worked with peasant and human rights groups, and a number of current and former leaders of activist groups. At the top of the poster is the message “CNN PERSONALITIES” claiming that they are linked to the Communist Party of the Philippines (CPP)-New People’s Army (NPA)-National Democratic Front of the Philippines (NDFP). 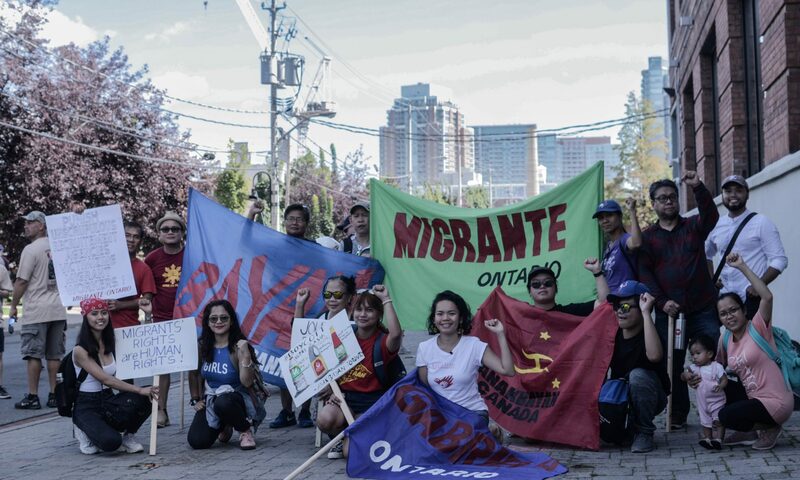 Members of Anakbayan from various regions of Canada echo the sentiment of many peace and human rights advocates that the “terrorist” label also could be part of the efforts of the government to suppress those who are critical of its policies and to criminalize legitimate dissent. The question has to be asked, do we feel any safer a year to the day with the escalating state-sponsored terrorism. “As someone who advocates for justice against human rights violations abroad, I find that it is incredibly frightening to see how defending the masses is seen as an act of terrorism. These activists are really the ones who are protectors of the land, fight for the rights and welfare of their communities and are the leading example of which we should all follow in our own day to day lives,” said Kristine Castaños, Anakbayan-Ottawa. In fact, red-tagging has become more common tactic by state security forces to expose many Filipino activists to harassment, intimidation and even killings. President Duterte has opted to silence those who uphold and promote the people’s rights to basic services. “A fearless, compassionate soul I had the honor to meet during my recent trip in the Philippines, Zara Alvarez of Negros Island Health Integrated Progran relentlessly fights for the rights and welfare of those who are oppressed. She is a rights defender, not a terrorist!,” said Sheryl Anne Montano, Committee for Health and Development for the Philippines — Anakbayan-Montreal. Anakbayan-Canada calls on peace loving Canadians, human rights organizations and peace advocates to stand up for human rights and take action to oppose this vilification campaign against human rights defenders in the Philippines. As the specter of nationwide martial law looms over the Philippines, we ask you to stand firmly with us. Our strengthened unity in the mass movement is our only real sanctuary, the people’s defense.